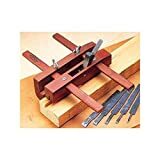 Whether you’re just starting out or wish to upgrade your important hand tools, this 5-piece Professional Woodworking Kit with matching rosewood and brass accents has all the essentials for producing the very best work. This fine set includes a 9 inch smoothing plane, 6 inch block plane, 9 inch try square, 9 inch marking gauge, 9 inch bevel gauge and a fitted wooden case. Took delivery of this kit less than a week after ordering, opened it to discover some serious shiftage of the contents sue to shoddy construction and rough handling. No big deal that, but as I investigated further, I found that the smoothing plane had areas of rust on the sole as well as under the frog-this despite being slathered in a thick coating of grease. Got that scrubbed up only to then find out that the sole of the plane was badly out of true, including the critical area just in front of the throat opening. This will take more than a session on coarse sand paper to fix- more like a vigorous (and exhausting) filing party. The chip breaker was filed to the wrong angle, and necessitated refiling and polishing to pull shavings. Everything else in the kit was usable once cleaned of the grease coat, and the block plane is wonderful-my new favorite tool (after honing and adjusting of course). There was a green discoloration on the rosewood tools from the brass inlays, annoying but not a problem. Overall, I would only recommend this kit to someone with a lot of spare time tune and repair the tools, but for the money, what else would you expect? The blade on the larger plane is nearly impossible to sharp.The square was not square.The marking tool is very difficult to use, maybe my own lack of skill on this one.The angle gauge works well.Both planes are covered with oil (good), but some residue was nearly impossible to get off (sandpaper did it finally).If you are a beginning woodworker, you at least need the square to dead on. I would recommend purchasing more high quality items so you can at least get a good start. I purchased this set from my local grizzly store mostly for the planes but I though it was a good deal for 90 bucks. The block plane (which I have not used much) seems to work alright. Sharpened up pretty well. The smoothing plane, on the other hand makes this set not worth the cost at all seeing as it is the main dish of this 5 course meal.I have spent at least 5 hours trying to flatten and hone the blade and chip breaker. Both of them were improperly machined and took a lot of work to get into useable condition. The first day I finally got it working it was throwing smooth wood shavings like a dream. Today I went back to finish up my project and noticed the plane leaving ridges in the areas that I had just gone over. There are now chips and dings in the blade that I will have to go back and fix. It seems to me that this set is really not worth the time even for beginners. I know woodworking tools are expensive but don’t waste your money on this cheap set. What SAWS do you NEED? Amazon Price: $140.00 (as of October 3, 2015 8:13 pm – Details). Product prices and availability are accurate as of the date/time indicated and are subject to change. Any price and availability information displayed on the Amazon site at the time of purchase will apply to the purchase of this product. We've redesigned our three most popular back saws to feature a slight tapering of the blade from toe to heel. 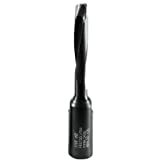 This taper gives you better control over precise cuts. When you reach the gauge line on the front of your stock, the blade is slightly above the line on the back side, which reduces the risk of sawing past your line. In addition, the taper introduces an angled approach to your stock (when holding the saw back parallel to the bench), enabling faster cuts with less effort. Our Tapered Crosscut Saw is patterned after our Carcass Saw but with a longer blade of 14" and thinner plate of .015". It tapers ¼" along the length of the blade, with a cutting depth of 2" at the toe and 2-1/4" at the heel. This combination of features yields a well-balanced saw that cuts extremely fast and precisely, with excellent surface finish. Teeth are filed crosscut, 14 ppi, set at .003" per side. Overall length, including handle, is 19." Overall height is 5." At Lie-Nielsen Toolworks we handcraft heirloom quality tools in Maine. Our Mission is to design and create beautiful, heirloom quality, hand tools that inspire woodworkers and other artisans. Through exceptional support and education, our customers receive the same personal attention we put into our tools. Torque Multiplier Usage – You will want one of these! Amazon Price: N/A (as of March 28, 2019 11:44 pm – Details). Product prices and availability are accurate as of the date/time indicated and are subject to change. Any price and availability information displayed on the Amazon site at the time of purchase will apply to the purchase of this product. Amazon Price: $61.00 $61.00 (as of March 28, 2019 5:52 pm – Details). Product prices and availability are accurate as of the date/time indicated and are subject to change. Any price and availability information displayed on the Amazon site at the time of purchase will apply to the purchase of this product. 8mm cutter for the Domino XL DF 700 Joiner for use with 8mm tendons. Durable, carbide-tipped cutters quickly and precisely carve out clean and consistently sized mortises, ensuring a perfect fit and precise joint placement. Amazon Price: $79.50 $49.99 You save: $29.51 (37%). (as of March 28, 2019 11:47 pm – Details). Product prices and availability are accurate as of the date/time indicated and are subject to change. Any price and availability information displayed on the Amazon site at the time of purchase will apply to the purchase of this product. Shapton Glass Ceramic Water Stones are the finest manmade ceramic water stonesâ€¦.period! This claim is based largely on two properties – the speed at which the Shapton stones cut and the edge they create. Shapton stones are designed to be harder, faster cutting, and denser than any other ceramic water stone on the market. Because they remove material quickly, the time required to hold a tool angle on the stone is reduced, making free hand sharpening much easier. Equally important to cutting speed is the consistency of the finished edge. The sharpest cutting edge is created by the finite intersection of two highly polished, flat surfaces. The finishing grits (16000 and 30000) of the Shapton stone system leave a polished surface free of the scratches creating a mirror finished, razor sharp edge. 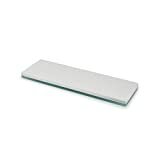 Each stone is comprised of a 5mm thick glass backing plate fused to a 5mm thick stone and measures 2-3/4â€ W x 8-1/4â€L. We recommend purchasing, and using, the Shapton stone holder. As it provides a secure platform and protects your stone when in use. Amazon Price: N/A (as of March 28, 2019 4:53 pm – Details). Product prices and availability are accurate as of the date/time indicated and are subject to change. Any price and availability information displayed on the Amazon site at the time of purchase will apply to the purchase of this product. Approximately 20 years ago Mujingfang decided to begin producing high quality Chinese Style Planes. Previously, the manufacture of these planes was a cottage industry with little or no quality control. Mujingfang gathered the best planemakers from around the country and brought them to their Hong Kong factory from where they supplied master craftsmen throughout South East Asia. Recently, they decided to offer their handmade planes to Western woodworkers. The body of our Adjustable Plough Plane is made from select pieces of Rosewood. The fence can be set to cut a groove 0" – 4" from the edge of the work piece. Five high carbon steel blades are included in sizes 1/8", 3/16", 1/4", 3/8" and 1/2". It can plough a groove up to 3/8" in depth. The blades are sharpened and will cut. But for best performance, they should be fully honed prior to use. The length of the plane is 7". The Leatherman Wave! And Leatherman bit kits a must have for prepardness. Amazon Price: N/A (as of March 28, 2019 1:09 pm – Details). Product prices and availability are accurate as of the date/time indicated and are subject to change. Any price and availability information displayed on the Amazon site at the time of purchase will apply to the purchase of this product. 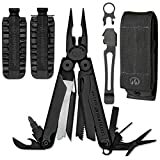 The Leatherman Wave Multi-Tool features stainless steel construction with a black oxide finish and 17 tools including the following: Two outside accessible 2.9" 420HC straight/serrated blades, two sets of pliers, spring-action scissors, medium screwdriver, two files, double-sided #1-2 phillips/flat tip bits, regular/hard-wire cutters. There's also a push/pull saw, an 8" ruler as well as bottle and can openers. The black MOLLE (Modular Lightweight Load-carrying Equipment) sheath features a nylon webbing strap with a snap closure on the rear, and a touch fastened front closure. The Wave is assembled in the USA. The 21 Piece Tool Steel Bit Kit x 2 from Leatherman works with any Leatherman tool or knife with an integrated bit driver. This multi-purpose set includes 21 two-sided tool bits with a variety of heads, including Phillips, Torx, Pozi, Slot, Hex, and Square-Drive. An included Leatherman-branded bit caddy accommodates all 21 bits and lays flat for easy storage. Amazon Price: N/A (as of March 28, 2019 5:29 pm – Details). Product prices and availability are accurate as of the date/time indicated and are subject to change. Any price and availability information displayed on the Amazon site at the time of purchase will apply to the purchase of this product. 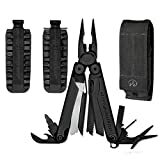 The Leatherman Wave Multi-Tool features stainless steel construction with a black oxide finish and 17 tools including the following: Two outside accessible 2.9" 420HC straight/serrated blades, two sets of pliers, spring-action scissors, medium screwdriver, two files, double-sided #1-2 phillips/flat tip bits, regular/hard-wire cutters. There's also a push/pull saw, an 8" ruler as well as bottle and can openers. The Black MOLLE Sheath features a nylon webbing strap with a snap closure on the rear,& a touch fastened front closure. The 21 Piece Tool Steel Bit Kit x 2 works with any Leatherman tool or knife with an integrated bit driver. This multi-purpose set includes 21 two-sided tool bits with a variety of heads, including Phillips, Torx, Pozi, Slot, Hex, and Square-Drive. An included Leatherman-branded bit caddy accommodates all 21 bits and lays flat for easy storage The stainless. The Leatherman Removable Pocket Clip & Quick-Release Lanyard Ring will make the perfect addition to your multi tool. This Pocket Clip is made with Oxide material that is guaranteed to be long lasting and incredibly efficient. The Removable Quick Release Multitool Pocket Clip will work with the Charge ALX, Charge TTi, Surge, Charge AL, Charge Ti, Charge XTi and Wave multi tools, to provide you with the perfect carry option for all day use. Amazon Price: N/A (as of March 29, 2019 4:04 am – Details). Product prices and availability are accurate as of the date/time indicated and are subject to change. Any price and availability information displayed on the Amazon site at the time of purchase will apply to the purchase of this product. The Leatherman MUT Multi-Tool offers a durable, reliable and highly versatile addition to the avid handyman's tool kit, making it an excellent choice for use at home or on the job. This multi-tool offers an array of 17 tools packaged into one ruggedly constructed device. A stainless steel body and pair of handles help to protect against corrosion and other weathering and aging damages while a compact design allows for quick and easy storage and transportation. 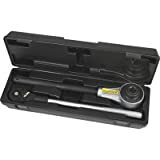 Each tool locks firmly into place when in use or stowed, helping to prevent tools from slipping or otherwise shifting while the device is being used. The locking action provides an added degree of safety. 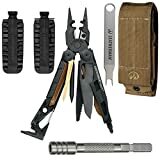 Additionally, the EOD Multi-Tool comes complete with a MOLLE sheath for enhanced protection and carrying capability, as well as a titanium pocket clip for even swifter access. 21 Piece Tool Steel Bit Kit x 2 works with any Leatherman tool or knife with an integrated bit driver. This multi-purpose set includes 21 two-sided tool bits with a variety of heads, including Phillips, Torx, Pozi, Slot, Hex, and Square-Drive. An included Leatherman-branded bit caddy. accommodates all 21 bits and lays flat for easy storage.